On Friday morning, we woke up and ate breakfast at the hotel. They had a pretty decent selection of food — we ended up making some waffles using the waffle iron and eating some biscuits and gravy, and probably something else as well. It wasn’t stunning, but it was pretty good, and it was free. We checked out of the Days Inn and noticed that there is a mountain view in front of the building. It was a decent place to stay, at a reasonable price ($60), at a good location. We’ll probably stay there again on future trips to the Smokies. We weren’t terribly far from the Great Smoky Mountains National Park. The directions I initially got had us driving along the edge of the park instead of through it, but I thought we might like to get a glimpse of the park before continuing on to Charlotte. Plus, we wanted to drive on the Blue Ridge Parkway, which starts (or, more accurately, ends) in Cherokee, NC. You have to go through the park to get to Cherokee, so it made sense to do it this way. To do this, we had to drive through Gatlinburg, Tennessee, which is where a lot of people like to go for their Smokies vacations. It didn’t look at all appealing to me, with endless strip malls, hotels, and a vast array of tourist attractions, most of which had nothing to do with the mountains at all. I understand that what a lot of people want isn’t the same as what we wanted (to be close to nature and away from crap like that), but it still seemed weird to me that people go so close to so much beauty and spend their time in resorts or playing miniature golf and go-carting. We stopped at the visitor’s center, primarily because Sarah was getting a little carsick. It was getting hot, and the air conditioning in our car doesn’t work, so the heat combined with the mountain roads was making her feel a bit sick. She felt better after a few minutes, and we continued on our way. I didn’t mind picking up a few maps and pamphlets anyway. The drive through the Park on 441 was just awesome. I was tempted to pull off at each overlook and gape at how awesome the mountains were, but I knew if we did this, we would never reach Charlotte. Besides, we’d be back later in our trip. We decided not to stop at all during this trip through the park. It was also a very fun drive, as it’s a windy mountain road. I was a little concerned about how well the car would handle it, but we had no problems. We listened to the Woven Hand album “Mosaic” while driving through the park. I thought the mood and atmosphere of it fit the scenery perfectly. After driving through the park, we stopped in Cherokee, NC for lunch. 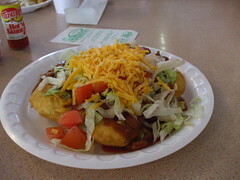 We ended up eating at the “Riverside Cafe II.” Sarah had the flounder basket (which was not served in a basket), and I had an Indian Taco, which was described to me as a funnel cake (not sweet though) topped with chili, lettuce, tomato, and cheese. It wasn’t bad, but I have to wonder if it was approximating a specific Cherokee dish, and if so, what that dish really would’ve tasted like, because I’m sure this wasn’t it. 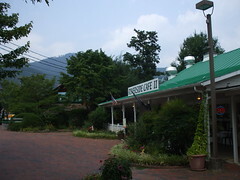 We also got some coffee at a local coffee shop (my photo didn’t turn out) and headed out toward the Blue Ridge Parkway. I share your estimation of Gatlinburg–not the reason I go to the Smokies. That shot of the Smokey’s reminds me too much of what is going wrong in the South. All this beautiful land being paved for commercial establishments. Very, very sad. And listen, this is a guy that lives in Jersey saying this!!!! 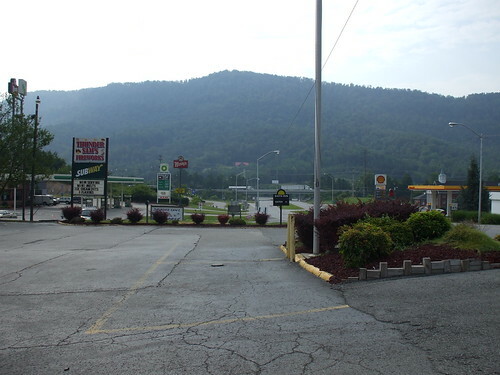 When Sue and I went to Gatlinburg a few years ago, we turned around at the 57th mini golf course we came across, and left the area. It was so depressing compared to most of the Smokies. We stay in Culowee NC when we go down that way. I’ve always wanted to see that park – but I’ll skip the Indian Tacos, thanks.